Hi guys! In this post you will some interesting pieces that I got recently. 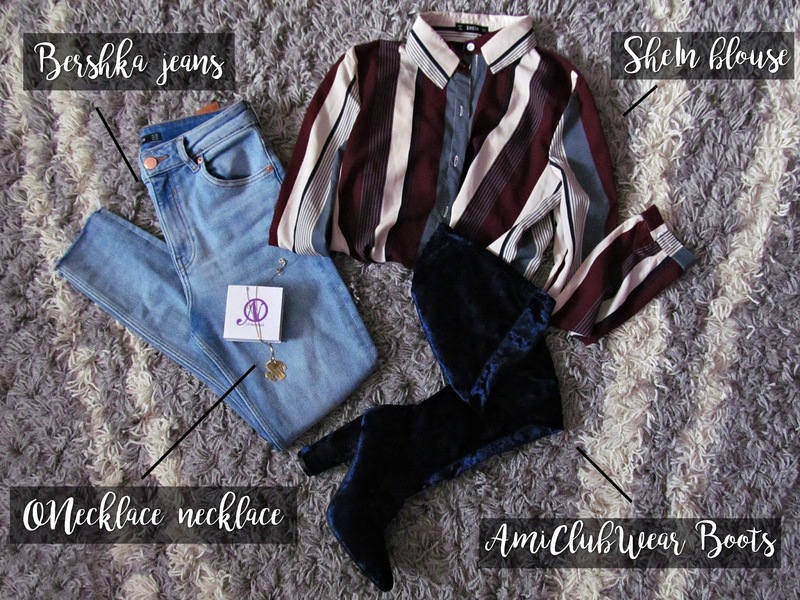 This is not usual haul because I made an outfits from the pieces that I got. Stay tuned to see some of my outfit ideas and my new items and let me know what is your fav! First outfit idea is perfect for night out or some fancy event. I paired my fav high-waisted jeans from Bershka with striped blouse from SheIn. It is great quality and fits me perfectly. You can shop it here. Next, perfect Amiclubwear over-knee royal blue velvet booties are nice statement to this look (shop them here). And last, but not the least I added some jewelry piece - ONecklace personalized necklace. Second outfit is for great for more special nigh out, party or birthday. ToSave women wide leg high waist pants and Zaful black top are perfect match. Amiclubwear black booties (shop them here), necklace and purse and you are ready to go. Who doesn't like to have comfy but stylish sleepwear?! This beautiful baby pink sleepwear, perfect for hot summer night you can find at SheIn online shop here. And what about this hot purple one women lace bath robe? Satin is perfect for night to make yourself look nice and comfortable. This piece is from ToSave online shop and it comes with one pair of thongs. You can find more details here.